We all know it, almost too well. We feel the urge to bake a sumptuous treat, one that will satisfy our cravings for desserts, but we also feel too lazy to spend an entire afternoon making an Insta-famous multi-layer cake, or some other mouth-watering extravaganza. If this sounds like you, I have the perfect cake for you. 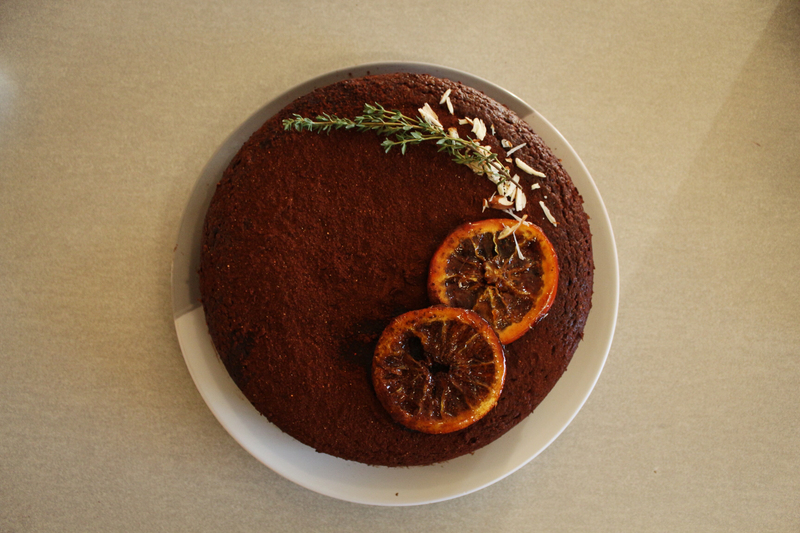 I’m a big fan of the flourless orange chocolate cake by Nigella Lawson, even more so when you sneak in some chilli chocolate spice; done right, this subtly sweet cake is gonna wow your friends with pops of crunch, zing, and spice. It’s the right balance of naughty and nice. To really put my mark on this cake and the recipe, I didn’t stop with the addition of chilli chocolate. The recipe originally called for hazelnuts, but I used almond as that’s what I usually have on hand at home (feel free to use any nuts you want/have stored away!). My take on the recipe also throws whiskey and coffee into the mix: coffee adds to the cake’s richness as it heightens the chocolate flavours (a great tip for all bakers, especially chocolate lovers! ); and whiskey? Just because. As for the chilli chocolate itself, I used the chilli chocolate spice from Gewürzhaus – a flavour utopia for me to step into and buy, buy, buy. The salesperson said that this particular spice is amazing for brownies, which I think is true. Even just a little bit instills in any baked good a strong character and an unforgettable kick (just don’t choke on it, haha). Taste buds singing yet? What are you waiting for? Make this satisfying and modest cake this weekend. It will give your taste buds the warmest hug. I hope you’ll love it as much as I do :). Prepare a pot of water in a saucepan. Make sure that it is big enough for the oranges and the water; cover, and bring the water to boil. Put the oranges into the water (be careful), reduce heat to low, and simmer for 60-75 mins, or until they are soft enough for blending. Move the oranges occasionally to prevent them from sticking to the pan. While the oranges cook, preheat the oven to 375F (190C). Take the soft oranges out of the pan with tongs. Let them cool, until they are cool enough to touch and handle. Cut each orange into 4 pieces, removing any large seeds as you go. Put the orange pieces into a blender/food processor and blend them at medium speed until you get a puree texture. Pour the puree into a separate large mixer bowl. Add all the remaining ingredients, except the chili chocolate spice, to the bowl. Stir with a spatula until everything is well incorporated. Grease and line an 8 inch round cake pan. Pour the cake batter into the pan. Tap the pan several times to break any air bubbles. Bake the cake for 50-55 mins, or until a toothpick inserted in the cake’s centre comes out clean. Let the cake cool for at least 20 mins. Take it out from the pan. Dust the cake’s surface generously with chilli chocolate powder. You have some fabulous recipes on your blog. I’m going to try some of these during my next baking spree. Thank you for your support. It means a lot to me. Please let me know how your baking experiments go :)!